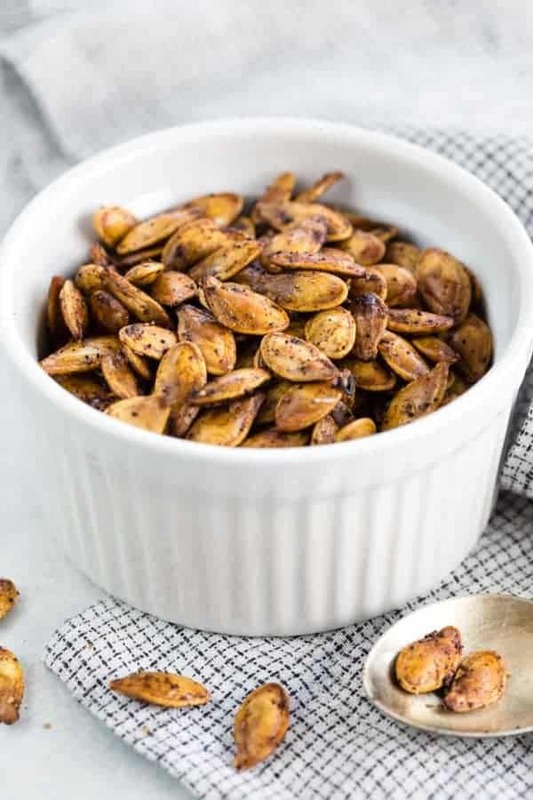 Save the seeds from your pumpkins this year and make roasted pumpkin seeds for a healthy, crunchy snack. If you’re carving a Jack-O-Lantern, then don’t waste the goodness inside, follow this easy step-by-step guide, and you’ll be rewarded with a special treat! Whether you’re carving spooky Halloween pumpkin faces or making homemade pumpkin puree from scratch, don’t forget to save those edible seeds inside! I had a fond childhood memory of my elementary school teacher showing our class how to roast pumpkin seeds in a toaster oven after making our Jack-O-Lanterns. This healthy snack recipe is easy to make at home and a fun project to get the kiddos involved. Don’t throw out the seeds! 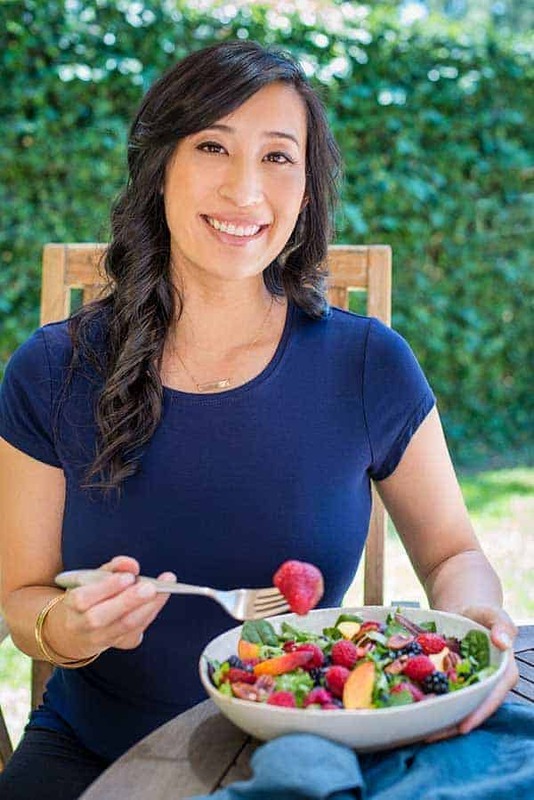 Make a tasty and healthy snack in a few simple steps to add flavor and irresistible texture to each bite. Pumpkin seeds are composed of two parts; the cream-colored shell and the kernel or pepita which is olive green in color. Both are edible, so you can’t go wrong roasting the whole seed and enjoying the maximum nutritional benefits. Use a large spoon or ice cream scoop to remove the inside pulp, stringy fibers, and entangled raw seeds from the pumpkin. The seeds from carving pumpkins and pie pumpkins are edible. Depending on the size of your pumpkin, the more or less yield you will have. My pumpkin seed recipe uses a 3-pound pie pumpkin that I used to make homemade pumpkin puree for a delicious pumpkin pie. Add the seeds to a colander, wash and remove any pulp left on the seeds. It’s okay if some flesh remains. Make sure to dry the seeds as much as possible in between a towel. This process will help to crisp up the seeds during roasting. Any excess moisture will create steam in the oven and prolong the cooking time. Toss the seeds in a bowl with olive oil, salt, garlic powder, paprika, and black pepper. Make sure to separate and spread the seeds evenly on a lightly greased cookie sheet for even roasting. 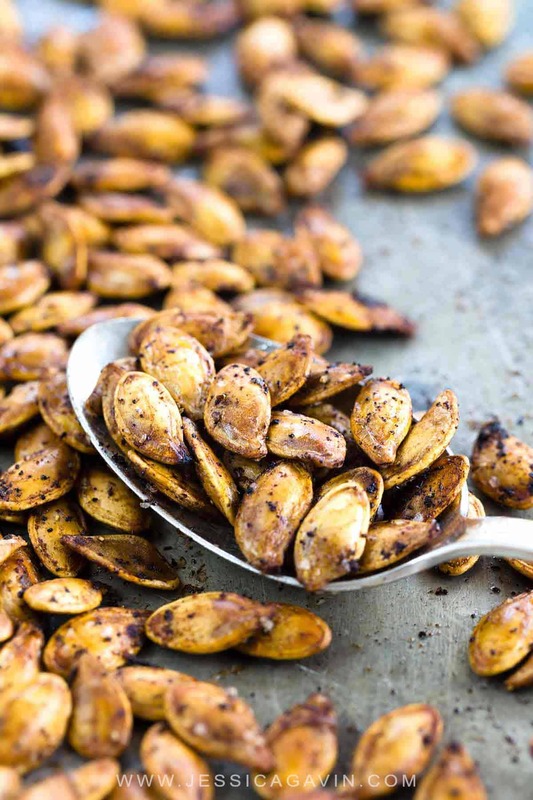 The seasoned pumpkin seeds get roasted at a moderate heat of 350°F for about 20 to 30 minutes, tossing the seeds every 10 minutes to encourage even browning. When the seeds give a nutty aroma and golden brown color, they are ready! Ease: Since you’re already taking the time to cut and remove the seeds, why not pre-heat the oven and quickly make a snack! Versatility: I’m sure your pantry is already filled with seasonings to create unique and tasty combinations. 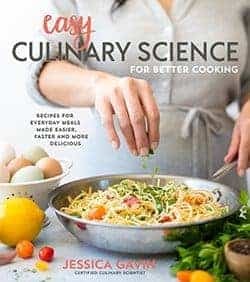 You can use any seasoning mix, like some chili powder for heat, curry powder or cumin for a more earthy flavor, or even a sweet taste with cinnamon and maple syrup. Feel free to use vegetable oil, butter or coconut oil instead of olive oil. 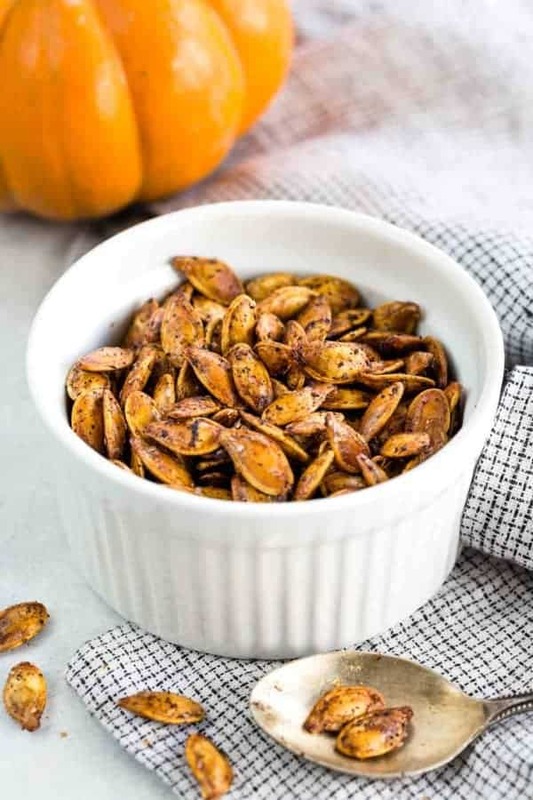 Nutrition: Eating the whole pumpkin seed provides fiber and an excellent source of zinc from the shell and the nutrients phosphorus, potassium, magnesium, and iron. According to the USDA National Nutrient Database, in 1 ounce (28 grams) of pumpkin seeds provides approximately 126 calories, 5.3 grams of protein, 5.5 grams of fat mainly from unsaturated sources, 15 grams of carbohydrates and 5 grams of total dietary fiber. If you’re a fan of pumpkin seeds, I’d love to hear your flavor combinations and uses in the comments section below! Do not waste the seeds from pumpkins, they can be made into a healthy and delicious snack! Learn how to roast pumpkin seeds with this step by step guide. Roasted pumpkin seeds can be stored in an airtight container for up to 2 weeks. The recipe can be easily doubled or tripled depending on how many seeds your pumpkin yields. « What is Pumpkin Puree? Perfect timing Masooma! Yes, add any spices you like and enjoy the snack 🙂 I bet the boys would love to help you! We are doing great, miss you all! What can we use besides kosher salt? Do you have sea salt? Garlic salt would work as well. If you use table salt I would add half as much. Every fall I struggle with how to do this. As usual your recipe was perfect. Thanks so much Jessica! I’ve found that cooking up the job lot-flesh and seeds brings the seeds easily to the top of the pan with a bit less faffing about separating everything and sure looking forward to trying your recipe, though will be using Cornish Sea Salt. Great simple recipe! Definitely the hardest part was separating the flesh and seeds. Ended up soaking the seeds in the sink. The seeds float and the flesh sinks/ suspends. Only had to skim the top of the water then, but I had to let the seeds dry over night. That actually seemed to work for the better as it provided another opportunity for a family afternoon activity for the weekend (having carved the jack-o-lanterns the previous afternoon). Mine seemed to be done after twenty minutes, but kept them in until closer to thirty. They have a slightly burnt taste, but it was a lot of fun! Thanks for posting. I appreciate the tips, Jeremy! Do you think the slightly burnt taste from the cooking time or seasonings? We just made your recipe. Awesome! So at 20 minutes they were perfect for those who like the seed but not the shell. At 30, throw the whole seed in and eat it all! Both were perfect! Thanks!! Thank you so much for your feedback on cook time and temperature Martina! I do a mix of Tony Chacheres and brown sugar and cinnamon. Yummm. Oh, I’m loving the sweet and savory combination Amanda, yum! Ever tried other squash seeds? Making these now with my 11 year old. He loves to bake. I rinse my seeds then let them soak overnight in 1/4 cup of melted butter and 1/4 cup of Worcestershire sauce. I do NOT dry them overnight. Then I spread them on a cookie sheet and bake them on 325 for about 30 minutes until a medium brown, “stirring” them often. Delicious!!! Wow, that sounds savory and delicious! After carving the seeds, I forgot I left them in an air tight Tupperware for a week, not in the fridge. I cleaned them up pretty good even tho the smell was rather vile. 4 cups worth of seeds. I let them dry over night, 2 nights actually. After the 1st night, they still smelled kinda funky and still damp. Today they smell fine and are dry. Anyhow, is it worth still roasting to eat or am I putting my health in jeopardy? Hi There! Although it sounds like a labor of love, if the sounds smelled sort of rotten or moldy, I would err on the side of caution and throw them out. Lot’s of great deals on pumpkins right now at the store! If I left my seeds out on the. Ounter doe the weekend, will they still be okay to roast? Thanks! Hi Rebecca- Were the seeds cleaned and dried when left out? If they still are pulpy, I would not use it and get some new seeds. Thanks! This recipe turned out so good and it was very easy. Thank you for sharing!! Do you boil the seeds first? Hi Kenzi- No need to boil the seeds. I love the addition of the lime Nathan! Thank you for your feedback. Curry powder, cinnamon, and coconut aminos!! I loved the taste of these but they were a bit “woody” I roasted them til golden brown but maybe not long enough ! Or too long ! The seeds were fresh , dried in a towel after washing them. Hi Sherry! What was the texture of pumpkin seeds? Did they seem crisp enough? Paprika has an earthy flavor, so you think that is the woody taste you perceived? And a sweet batch with maple syrup, cinnamon and a dash of salt. Oh I must try these tasty variations Tessa! This recipe is a nice mix with the Olive oil, garlic powder and paprika. My daughter wants me to roast pumpkin seeds every year but its always hard to crack and eat the seed inside the shell….what’s the best way to eat them? Hi Christine- Enjoy them whole (no need to peel!). Otherwise, crack the seeds with your fingers at the narrowest part of the seed and then peel it back. I made mine with olive oil, lawreys garlic salt, fresh ground black pepper, little bit of cumin and slap ya momma. They’re amazing! Oh wow, I’m going to have to give that combo a try! Last year I forgot about my seeds and was bummed they got moldy when I remembered to get to them. This year, our two pumpkins had seeds about the same size and your post inspired me to get baking pronto! I rinsed and rinsed but the easiest method was floating handfuls in a warm bowl of water and scooped all the floating seeds up and drained them. Your tip to towel dry them was a good reminder and my seeds toasted more quickly than I thought. 30 minutes was plenty toasty for ones on the sheet pan and I ate them shell and all! I had some in a casserole dish and they were less browned but easy to crack and eat. I only used oil and kosher salt and with 3 cups worth, I can share with my dad. I found this recipe quick fast after looking to do something with the seeds from our pumpkin. Very tasty I shall say 😁. My kids loved it and perfect shell crisp. My sister in law never had pumpkin seeds with the shell, but this roast made it a good experience for her. Awesome recipe!! After washing the pumpkin seeds, I put them in a food dehydrator at 125 degrees for about 2 hours before adding the other ingredients and baking them. Turned out crispy and tasted great! I used sea salt and roasted garlic and rosemary infused olive oil. Thanks Jessica my first success at roasting pumpkin seeds, I’ll never compost them again! Some of the variations in the comments sound good, I’ll be trying some of those as well☺. I used home grown small sugar pumpkins, so many seeds!